The scheme comprises two separate buildings within a six building development. Latour House to the North West corner of the courtyard comprises 11 units set to complete in September 2017. Montrose House in the South East corner of the courtyard comprises 10 units phased between September 2017 and January 2018. Externally the scheme is enclosed within a brick perimeter wall with landscaping and car parking provided. 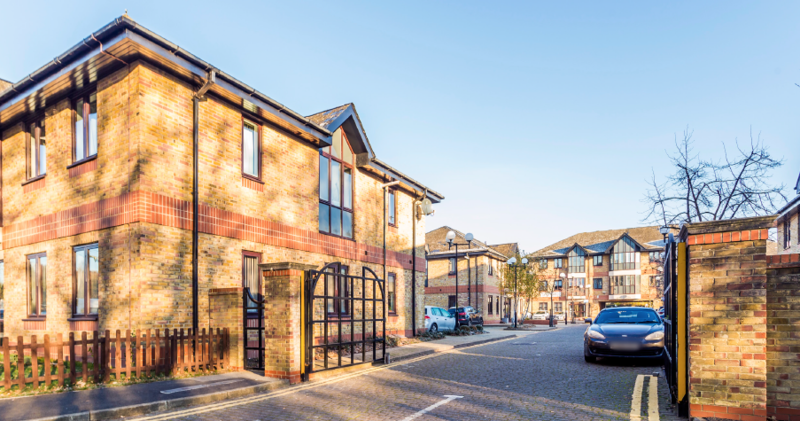 Chertsey offers a rare combination of the urban and rural lifestyle with acres of green land close by yet with easy transport links allowing you to access Central London by train on multiple routes and Heathrow Airport in around 15 minutes by car. Sitting close to the M25, flats for sale in Chertsey make access to London quick and easy. Train rides into London are around 30 minutes. So leaving work in Central London, you could be back home having a stroll along the river in lovely English countryside with your family in little under an hour. Other attractions for residents are the very good schools, some with outstanding Ofsted reports. One of the country's best hospitals, St. Peter's is close by and you are just 15 minutes from Heathrow Airport. There is plenty to do and see including several parks, woods and waterways close by that attract runners, walkers and cyclists. Golfers can enjoy the renowned course at Foxhills Golf Club and you are right on the M3 motorway too - providing easy access west towards beaches and countryside. Chertsey is within easy reach of the wonderful towns of Windsor, Kingston and Richmond, where you can enjoy shopping, entertainment and history galore.